There’s always been a lot of discussion & talk about the importance of data security and how to keep your files safe from thieves and hackers lurking around on the internet. Of course, nobody wants their private or confidential information fall in to the wrong hands. Therefore, it’s better to take optimal security measures before it gets too late. 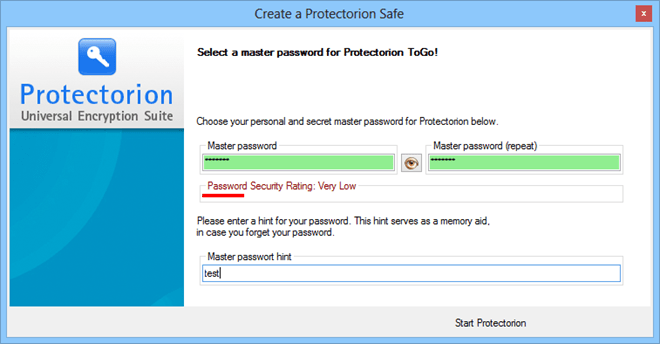 Fortunately, there are tons of free and low-cost apps available at your disposal that let you store important files in a private, password-protected vault, and one such app for Windows that we recently stumbled upon is Protectorion ToGo. Even though we cannot guarantee it will dodge the top-end data burglars or government agents, it does suffice for the job for keeping your sensitive data such as bank details, passwords, login information, and other files containing private information secure from prying eyes. The freeware tool does it all by protecting it using industry-standard AES-256 bit encryption, and boasts plenty of other features as well. The application is mainly designed to protect data stored on USB flash drives or external drives that people often require to carry around, but works equally well on internal hard drives as well. The application doesn’t require any sort of installation, which makes it a perfect companion for portable drives.